Flora loves reading superhero comics, but little does she expect to find herself in a superhero story of her own. The adventure begins when Flora witnesses an unfortunate encounter between a vacuum cleaner and a squirrel. Rushing to help, she saves the squirrel and names it Ulysses (after the vacuum cleaner). She soon discovers Ulysses has super powers; he can fly and write poetry. For Flora, a lonely child after her parents’ divorce, finding Ulysses gives life an amazing new purpose as she fights to save the squirrel from his ‘arch nemesis’. This is a quirky story about loneliness, love, daring to hope and superheroes. Children will find the characters appealing, enjoy the humour and have fun learning some really unusual words and comic style phrases eg ‘Holy Bagumba!’ The varied layout is also interesting with comic strip sequences for Ulysses’ adventures. There are lots of unusual words in the story such as ‘malfeasance’ and ‘cogitation’. After you finish a section or chapter talk about any unusual or puzzling words and what they might mean. Then check together using a dictionary or an online version. Talk about the different characters in the story and how they feel about each other. 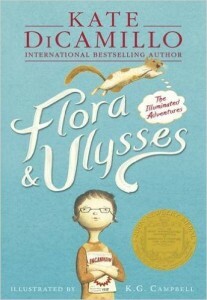 How does Flora feel at the beginning of the book and how does she feel at the end of the story? What has made a difference? Using A3 paper folded in half or pieces of A4 stapled together your child could make a comic about Ulysses the superhero squirrel. Draw the cast of characters drawn and captions about them. Use a double page to make a comic strip of one of Ulysses’ adventures eg how he became a super squirrel , the adventure in the Giant Do-Nut restaurant or a new adventure. Draw and label Ulysses’ favourite foods. Write a list poem like Ulysses does with some of his favourite words and favourite things.